Colvin & Moggridge » Island wedding ceremonies get a makeover at Hogarths Hotel. The former Victorian shooting lodge at Hogarths Hotel, near Solihull, known for its island ceremonies amidst historic fishponds has been renovated and extended for the 2013 Wedding Season. 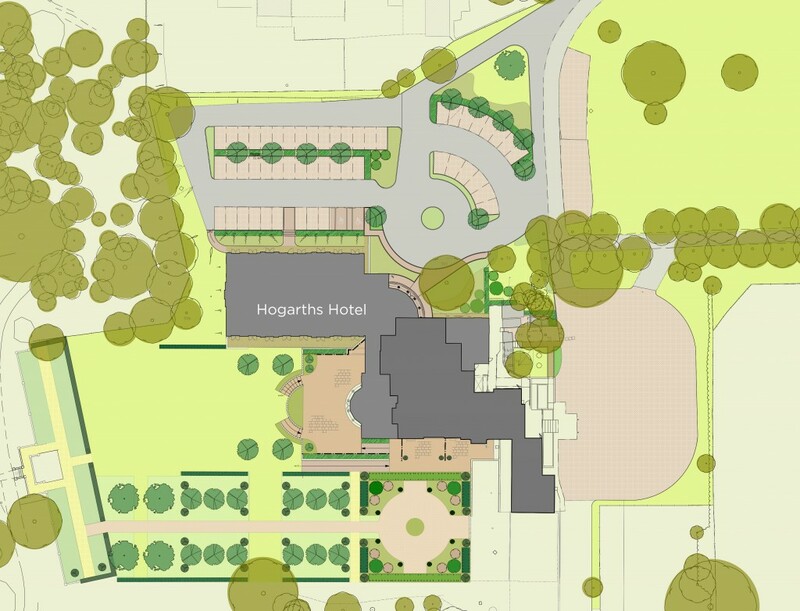 Our masterplan skilfully embraces arrival and parking around the north front entrance and creates new reception terraces linked by garden aisles to the picturesque island bridge below the hotel lawns. Enclosed terrace compartments are designed to give structure for all seasons and to ensure privacy between adjacent events. Imaginative new planting sets the scene. Pleached hornbeam, box and yew hedges and topiary, and avenues of cherry and holly frame the axes and milling spaces and draw the eye down the gardens to lower terrace steps that lead to the romantic bridge and island wedding venue.